In continuation with its ongoing clearance operations of the suspected Boko Haram terrorists’ hideouts, the Nigerian military has rescued more hostages and recovered weapons. The Director of Army Public Relations (DAPR), Col. Sani Usman, in a statement on Sunday, said the troops of 155 Task Force Battalion conducted a patrol to Nimila village where they rescued 14 persons from the clutches of Boko Haram terrorists and recovered weapons. Usman said the rescued persons were mostly women and children. The troops, he said, also recovered three Dane guns; a single barrel and two double barrels. “They further recovered three motor cycles abandoned by the terrorists, in addition to two mobile telephone,” he added. 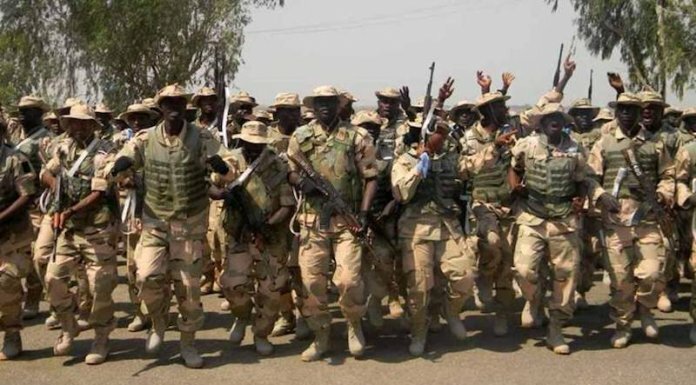 Meanwhile, the Nigerian military authorities have said the planned establishment of a naval command post in the Lake Chad region is to checkmate the influx of Boko Haram terrorists from the contiguous boundary with Chad and Niger Republic. THISDAY gathered that the federal government and military authorities are concerned about the threats posed by the reluctance of Chad to man its own border and prevent the terrorists from using their territory as a safe haven. According to sources, the approval for the establishment of the naval post by President Muhammadu Buhari last month was a subtle warning to Chad over its failure to adhere to the agreement of the Lake Chad Basin Commission (LCBC) countries under the Multi-National Joint Task Force (MNJTF) to push Boko Haram out from their common borders. “There is a growing concern that with the way Chad is acting, we have to take our destiny in our own hands. And if Nigeria does not act now, all the efforts and successes we have made to clear the terrorists from the country maybe jeorpadised in the future if they have a safe haven in Chad. “If you observe closely, you can notice that apart from some of their strong enclaves in Sambisa and Allargano forests, the next place we still have pockets of Boko Haram remnants is within the two local government areas and some other islands close to Chad and Niger,” a military source said. This was also confirmed by the Director of Information (DINFO), Nigerian Navy, Commodore Christian Ezekobe, who said the Naval post is to secure the territorial integrity of Nigerian around the region and protect the surrounding islands. Ezekobe however noted that the takeoff of the post is dependent on when the newly created 8 Division of the Nigerian army, comes into force. He explained that the surrounding land area needs to be well secured by the army before navy would move in to maintain security around the territorial waters and islands. “This is being set up with a view to checkmating the illegal entry of the Boko Haram terrorists through the Lake Chad and surrounding boundary area. This is also to ensure the security and territorial integrity of the islands within Lake Chad. “They are however going to wait until the army establishes the 8 Division to cover the area. This is because the territory and surrounding area need to be secured and protected since we are mostly going to be on water,” he said. Speaking further, the DINFO was emphatic that the military post is solely a Nigerian arrangement and not under the LCBC and MNJTF agreement. “Whether this is going to be under the LCBC or any other multinational arrangement. No. This is totally a Nigerian arrangement,” he clarified. President Buhari had on March 22 approved the establishment of a naval command post in the Lake Chad region in a bid to strengthen the fight against insurgency in the North-east. The naval spokesman explained that the naval personnel for the command post are currently undergoing training in the North-east and would be deployed once it becomes operational. He also revealed that the Nigerian Navy already has three categories of forces working in the North-east.